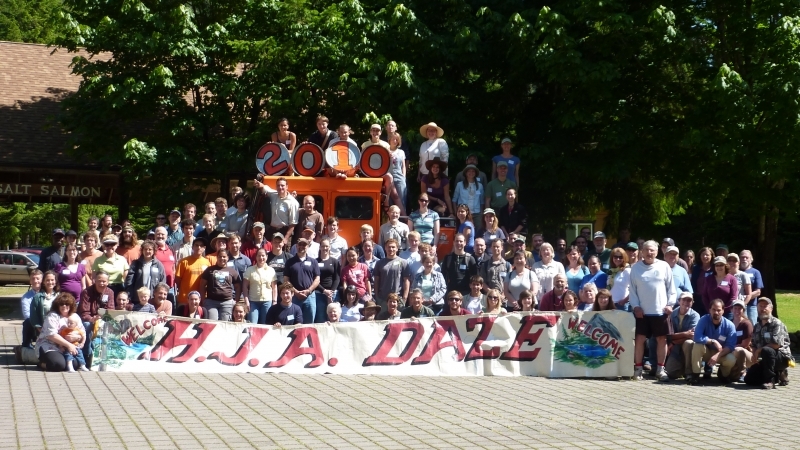 HJA Day has been an ongoing event at the Andrews Forest for many years. Here, attendees pose for a group photo at the 2010 event. Photo by Jay Sexton. HJA Day is an annual field gathering to share information about research, outreach, education, management, and arts and humanities at the Andrews Forest. The full-day event takes place at the HJ Andrews Experimental Forest in Blue River, Oregon, and features presentations and field trips. HJA Day is hosted by the Andrews Forest Long-Term Ecological Research (LTER) Program. In 2018, HJA Day highlights the 70th anniversary of the 1948 establishment of the HJ Andrews Experimental Forest (see our History page for more on the history of the site). 9:30 AM: Coffee and pastries. Sign-up for afternoon field trips. Cafeteria. 10:15 AM – 12:00 PM: Morning stations. Around Headquarters. 12:00 – 12:50 PM. Lunch. Attendees bring a sack lunch. Headquarters. 12:50 PM: Assemble for field trips. Load vans. 1:00 – 3:00 PM. Field Trips. 3:00 PM: 70th Anniversary cake and celebration! Transportation from the OSU campus is provided. Morning refreshments and an afternoon snack are provided. Participants bring a sack lunch.